After unpacking and getting organized Saturday morning, I called our friends George and Susie to see when we could come for a visit that afternoon. I brought down some Tums for Susie and more importantly a nice sum of money from my Borucan home party that I had this past September. Susie suggested that we stop by between 3:30 and 4:00, which sounded good to us. 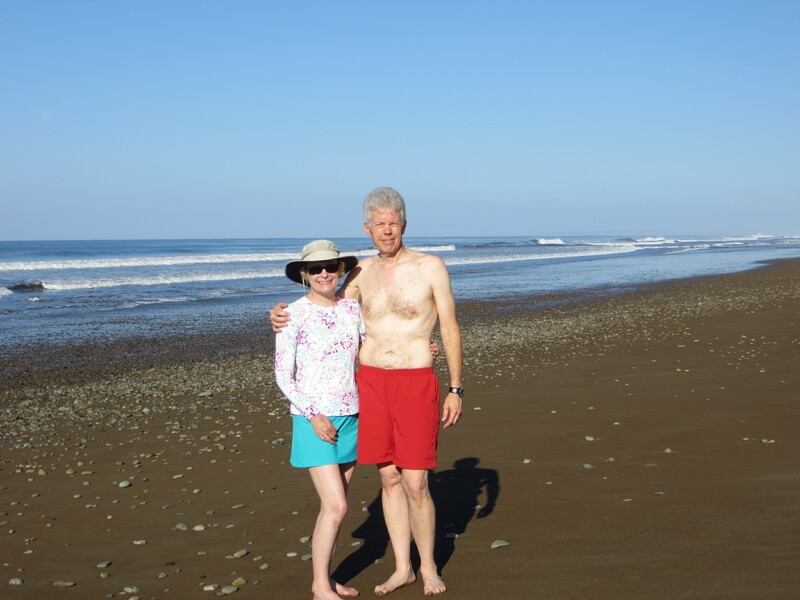 Let me back track a bit here…George and Susie have lived in Dominicalito (next door to Dominical) for about 20 years. They own a B&B Eco Lodge called Pacific Edge. We have been staying with them since 2007 when we bought our land. We have always stayed in cabin #2…they have four, but we think #2 is the best one for us. Their place is beautiful with a gorgeous ocean view! For the past 15 years, Susie has been helping the Borucans, one of the indigenous people of Costa Rica. The Borucans make gorgeous painted masks and woven goods – purses, coin bags, tote bags, place mats and much more. Susie has been trying very hard to broaden their market base. She created a website for them, has been teaching the matriarch Marina all about PayPal, etc. Marina’s group is called Artesanos Naturales. The following is a link to their website: www.borucacostarica.org. On one of our trips, we accompanied Susie to Boruca and Marina showed us their entire process of creating their woven goods. Our visit to Boruca was the highlight of our trip. I volunteered to help by having a home party, which was very successful. So much so that Susie has lined up a few other friends in the States to have home parties, too! OK, now back to seeing George and Susie on Saturday afternoon. We had a couple hours until stopping by Pacific Edge and we decided to drive to the discount grocery called Maxi Pali just outside Quepos about a 30 minute drive. We needed to buy some groceries and a few household supplies. We had brought a cooler with ice (a necessity as it’s so hot). We had just enough time to shop and then drop things off at our rental house before going to Pacific Edge. Before we left, we had dutifully locked all the doors as Lopez has instructed. He had left earlier in the day and still wasn’t back when we arrived to unload our stuff. Eddie put the key in gate to our pool area and tried to unlock the door. It wouldn’t budge…not only that, the key wouldn’t come out of the lock. It was stuck in there! He twisted it and turned it for at least 15 minutes to no avail. The key stayed stuck in the lock. This key was the one that opened our iron gate in front of the door to our little house! So we were locked out and had no idea when Lopez would return. Well, I was freaking out big time! Not only were we going to be very late to Pacific Edge, I was worried about where we were going to sleep if Lopez wasn’t back when we returned. I was giving Eddie some grief about it using some swear words, which I hardly even use, even though it wasn’t his fault at all. Poor guy! Our casita next to the pool. Arrived at Pacific Edge and it was great to see George and Susie once again! Fortunately, I had Susie’s money with me, but not the Tums, so she will have to wait a little longer for them. It’s a good thing she’s not in a hurry for them. While George was checking out our new truck with Eddie, I was telling Susie all about our being locked out of the house. (Unfortunately, they were all booked up. So no room at the inn for us.) 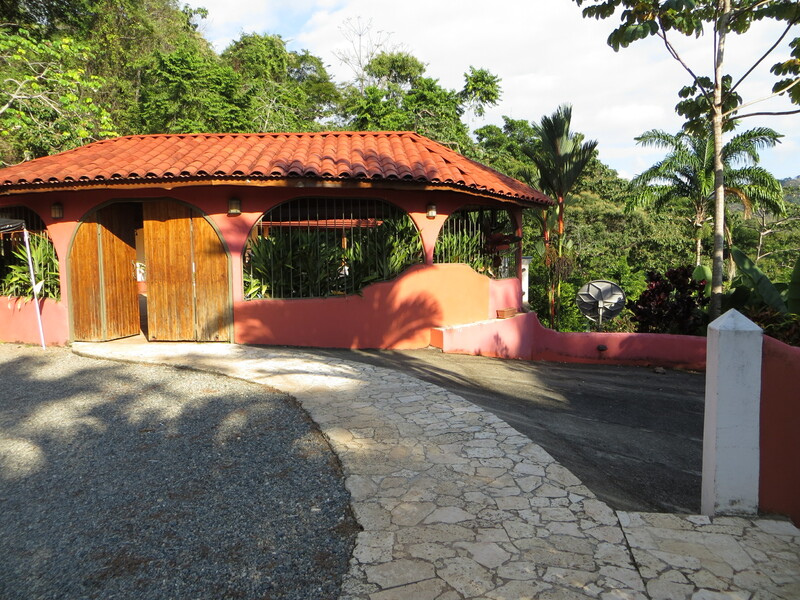 After chilling out with a glass of wine with Susie, I realized that the lower level of the main house was unlocked, so we did have a place to sleep if Lopez was gone all night. (This was a distinct possibility as he was out all night on Friday and didn’t get back until 4 a.m. on Saturday morning. I know this because his little dog barked and barked until he got home.) Anyway, it was such a relief to have a plan B! As it turned out, Lopez was waiting for us when we got back and he had taken the lock apart to get the key, which seemed to fix it. Thank goodness!!! On a less stressful note, Sunday was a relaxing day! We spent the morning at the beach. Then, Eddie caught up on work and I tried to catch up on emails. 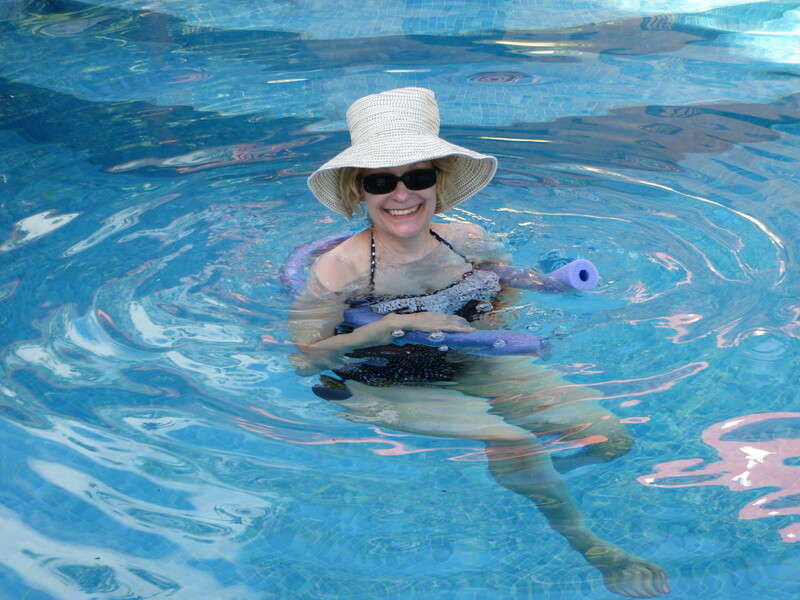 It was very hot, so we spent a good deal of the afternoon in the pool, which was very nice! Pura vida! A morning walk/swim at the beach…unfortunately it is a bit crowded! Ellen enjoying a swim in our pool. Hi Ieva, Glad you two are enjoying our blog! I’m enjoying writing it. Life here is certainly different from home, but it has its good points, that’s for sure! Stay in touch. Eddie should have tossed Ellen in the drink could imagine the words she called you. I say your a fine upstanding man with a lot I hair. Hey El Britto – I didn’t call Eddie any bad words, I just meant I used them in general…it doesn’t surprise me that you misunderstood!